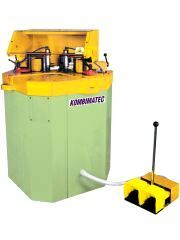 Kombimatec CC124 pneumatic corner crimping universal machine, suitable for multiple aluminium systems, with frame support arm set, foot pedal, pneumatic clamping unit, 1 x profile backing block 20mm, 1 x profile backing block 20mm, 1 x profile backing block 40mm, 2 x crimping tools 3mm, 2 x crimping tools 5mm, 2 x crimping tools 7mm. Specialist tooling available on request, including multipoint crimp heads and anvils. References available. Well built, powerful, market leading corner crimper.